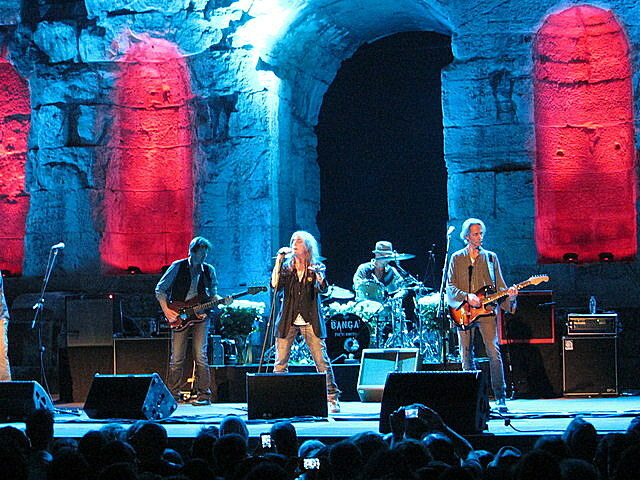 Last Saturday, we went to Athens to see Patti Smith at the Odeon of Herodes Atticus. 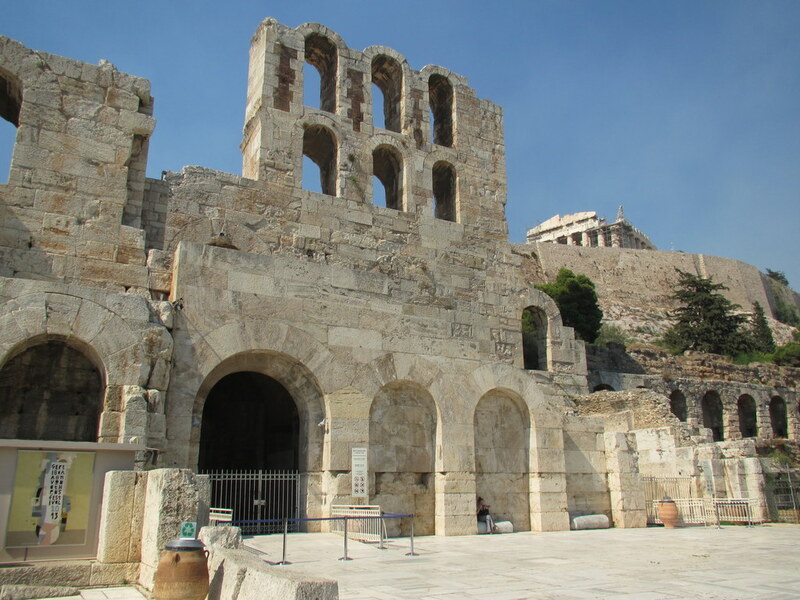 Herodes Atticus was a wealthy Athenian of the second century AD who built this 5000-seat structure on the southern slope of the Acropolis in 161. An odeon is different from a theatre in that an odeon is used for singing and musical performances, while a theatre is used for drama. Odeons are smaller than theatres, and were built with wood roofs (long gone, in this case). 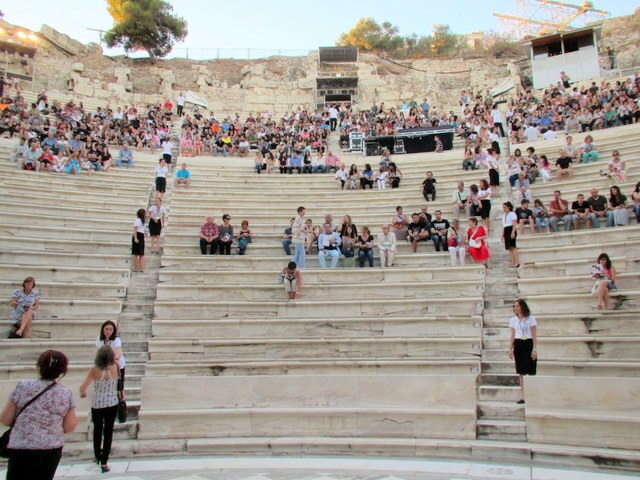 When you visit the Acropolis, you can look down into the odeon and, knowing that it’s used for musical performances during the Athens Festival every summer, it’s been a long-time wish of mine to take in a show there. 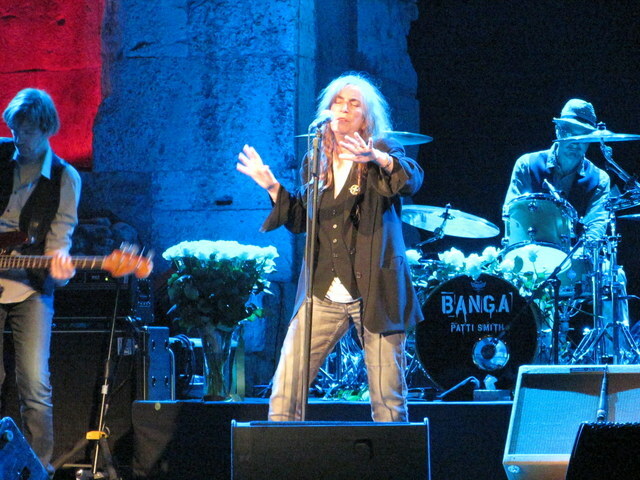 Susan made my wish come true with a Fathers Day present that included tickets to see Patti Smith at the odeon. We’d last seen Patti Smith in the mid-70s at the Cellar Door in DC. It was an electrifying show that made me re-think poetry, songwriting, and singing. That night has stayed with me over the subsequent damn-near 40 years, and I’ve followed her music ever since. But I’d never been able to see another concert. So Susan made real two of my dreams with tickets to the performance last Saturday. We went in about 30 minutes before the scheduled show start. That’s Sue sitting on the left. The show itself was magical. The setting is beautiful beyond my descriptive abilities. 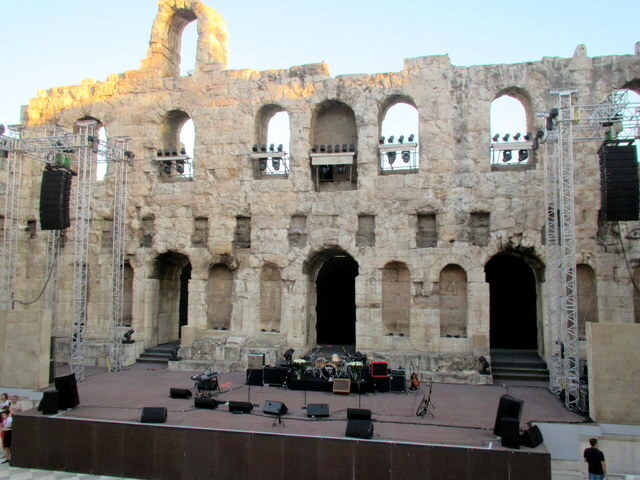 The seats and stage floor were rebuilt with marble from Mt. Pentelis on Athens’ northern border, the source of all the Acropolis marble, in the 1950s. (Yes, seat pads were provided.) But the rest of it dates back more than 1800 years, and entering through those ancient arches is spine-tingling. The millennia of history accrued on the Acropolis and in the Odeon are palpable in that building, and I think most of us were awestruck just to be there. And, as if more portent were needed, the full supermoon rose behind the stage during the show. The band is excellent, with Lenny Kaye, the group’s lead guitarist from the beginning, playing as if the guitar were an extension of his consciousness, and Jay Dee Daugherty, also an original, absolutely masterful on the drums — powerful, creative, solid, musical. We were blown away when Patti introduced her two children as members of the band that night — her son Jackson playing guitar and her daughter Jesse on keyboard. Patti’s performance was jaw-dropping. For me, it was as if those 4 decades had folded up in a time warp. She is 4 years older than me but she prowled around the stage just as she had done at the Cellar Door. At one point, she climbed down to the marble floor in front of the temp stage to dance, and invited the only-too-willing audience to join her. Her voice remains the same and her delivery is just as powerful as it was in the beginning. She fulfilled my wish with the fourth song of the night, Free Money, and went on to perform all of the anthems, including Horses, Ain’t it Strange, Barefoot Dancing, G-l-o-r-i-a, and Because the Night. She released an album last year, Banga, and based on what I heard her sing I’ll be picking up a copy. 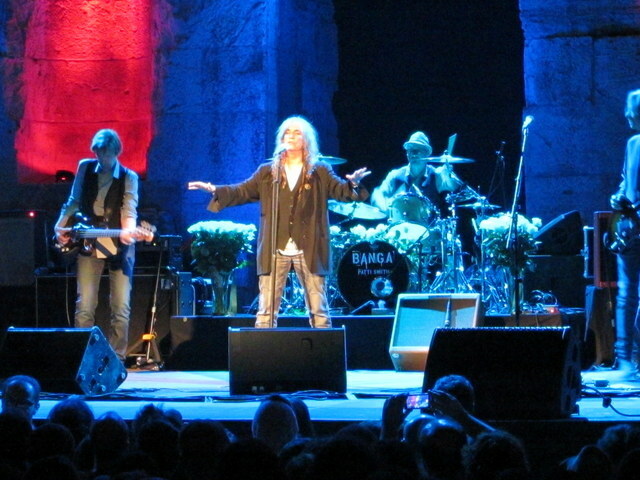 Patti’s commentary during the show made it clear that her imaginative energy is also undiminished. 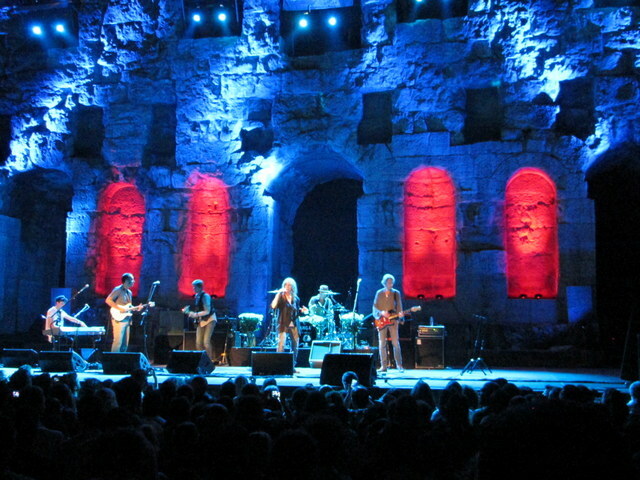 While celebrities are often tone-deaf or informed solely by news media when it comes to current events in Greece, Patti’s prophetic, oblique way of looking at life put her precisely in heart of the struggle with a determination to prevail with celebration, dance, song, and love. 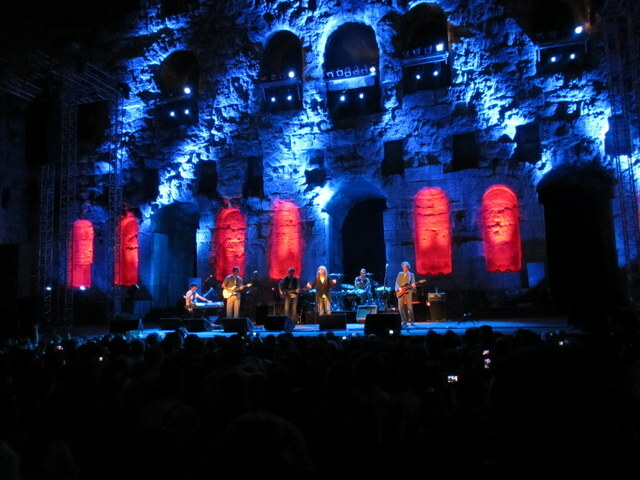 No one, including us, much wanted to leave after the show but eventually we milled our way across the floor and back through the stone arches. 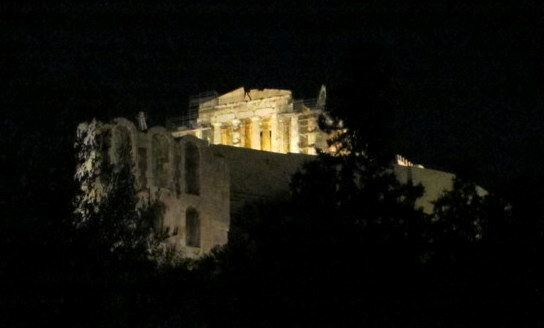 Once outside we found ourselves treated to the rare pleasure of a stroll under the Acropolis on a moon-lit summer’s night, a fair bit of magic in itself. …music still playing in our heads. This entry was posted in Greek Dreamscape. Bookmark the permalink. I loved this description of your magical night in Athens. There seemed to be so many special moments, that it’s hard to even comprehend getting to experience them all. 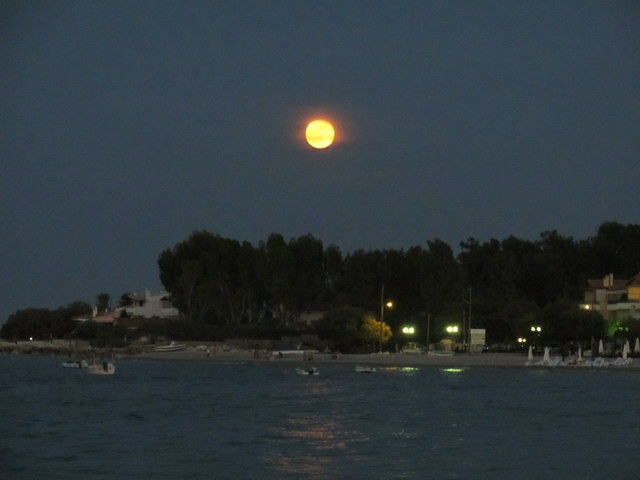 Having been in the shadow of the Acropolis recently, we would have been happy just to bask in the beauty of the supermoon…but would have definitely enjoyed the entire experience. Glad you liked the post, Callie. You’re right – there was so much extraordinary about that evening I was left gasping.